Welcome to JMT. 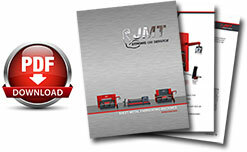 JMT has been designing, selling and servicing all types of machine tools for metalworking and fabrication. We have machines for bending, forming, rolling, cutting and positioning. We provide the right machines for your metalworking application, at the right price. JMT machine tools have an outstanding performance-to-price ratio, making them an excellent value. Regardless of the size and type of project that you envision, we have the experts and the machines to help you turn your vision into reality. We have already helped hundreds of companies just like yours find the optimal solution to meet and even exceed their needs. We invite you to discover how our integrity and world class customer service has earned us the friendship of these companies for life, and not just for one sale.